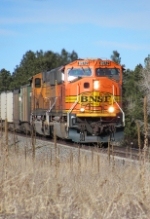 Title: BNSF 9996 "Upside Down Devil 6's?" Description: BNSF 9996 & BNSF 4987 meet in Old Monroe, Mo on a bright and sunny Sunday afternoon. Description: The DPU of a Northbound empty Baldwin Power Plant train heads for the yard. ~ BNSF Beardstown Sub. Description: First time to get good photos from this side of the bridge. Description: Q CHISBD6-30 With BNSF 9996, BNSF 8983, & BNSF 8913 with 59 Loads, 5228 Tons, 6053 Feet. ACs are a pretty rare catch in CA. Photographed at 16:19. Description: southbound on the Holly sub. Description: Found sitting at the CSX yard in Walbridge.